The Irish Writers Centre is taking their Publishing Day series on the road to connect with new audiences in Belfast and Northern Ireland. In association with Queens University Belfast, and supported by Words Ireland, this one-day seminar is suited to writers of all genres and forms who are seeking to get published. 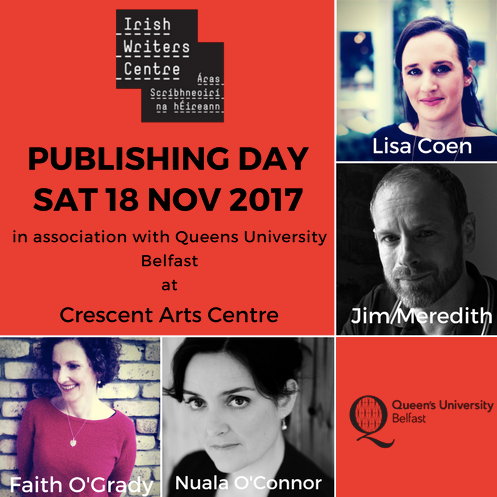 Lisa Coen (Tramp Press) will discuss the editorial and submission process, Faith O’Grady (Literary Agent) will present on agenting and rights, Jim Meredith (Publicist) will provide quality advice publicising and promoting your book and Nuala O’Connor (writer) will reveal all about her journey from aspiring novelist to published author. 11.50am-1pm: Faith O’Grady from Lisa Richard’s Agency on the role of the literary agent. 3.15-4.15pm: Nuala O’Connor on her journey to getting published.